How it all began ..
Pictured here are Mutton (the lamb that belongs to Jocelyn), Skin and Skinny (Darlene's and Janelle's bears). Many times, when I feel down, I look at them and they seem to tell me in their own simple and innocent ways, "C'mon, it ain't that bad!". Yes, there's still a child in me. In August 2011, I embarked on a project called "APAD" or A-Photo-A-Day. I wasn't sure if I could keep with the discipline of capturing an image each day - after all, some of my photo "kakis" gave up after a while. Fast forward to Nov 2012. I am proud that I am still on it, religiously taking a few photos each day, choosing one for my APAD Project and using my Flickr account to house the collection. Yes, there were times when I had skipped a day, but I was quickly back on track. There were days when the camera wasn't with me and I had to use my iPhone. But hey, don't under-estimate its capability. I slowly realised that this stream reflects how I see the things around me. My very own small world. So much to see, so much to miss if I don't take notice, so much to share with people around me. They are my eyes and my thoughts. It reflects my mood, too - if you look hard enough. I now aim to create this Photo Stream so that my family and friends can walk with me in my small world, see the things I see. I do not have much worldly possessions. I only hope that this simple stream will outlive me, provide for those who find it a source of comfort, enlightenment, inspiration or strength in their daily lives or simply for those who would like to view them and keep me in their thoughts after I am long gone. I apologise if any of my photos discomforts you - it's not intended to be so. Also, forgive my limited language capabilities. There are times when I have forgotten the grammar and tenses that I learned in school but I try to keep this Website easy to read and not use big words - I don't have much of these to use, in any case. Enjoy the Website. Enjoy life. Enjoy the people around you. Do not be a slave to material possessions - you can't take them with you when your time is up. We all came into this world with empty hands and we will leave it with hands just as empty. However, be sure to make an impression in the lives of those close to you. 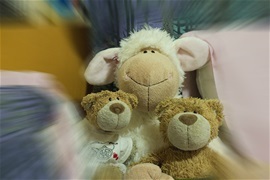 I dedicate this Blog to my beautiful wife, Jocelyn and 2 lovely daughters, Darlene and Janelle - represented here by the 3 stuffed toys. Hey Dom, why so quiet of late? I've still been updating my APAD! Less travelling now that Jocelyn travels to Boston to visit Darlene without me!! A blessed Lunar New Year to you and your family, Dom! May 2013 be a year of blessings, bright as the largest camera lens you have! Thanks, William. Do feel free to forward this link to those who still remember me.